Acapulco is great by day, but it really sizzles at night! 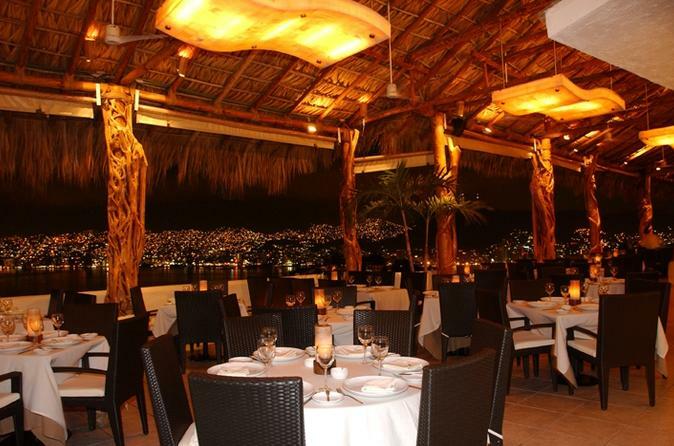 Enjoy a sumptuous dinner at Q.K Brisas restaurant, overlooking sparkling Acapulco Bay. Enjoy a drink or two as the daring cliff divers of La Quebrada dive into the shallow waters below. What a great night out! Experience the sophisticated atmosphere of Q.K Brisas restaurant, located on the hillside with a spectacular panoramic views. After dinner you will go to La Perla restaurant for drinks to enjoy the amazing cliff divers show at the famous La Quebrada cliffs. The divers first negotiate their way up the rugged face of the cliff and then dive into the sea while holding flame-lit torches! A must-see for anyone visiting Acapulco!